Rifki - thanoscardgamess jimdo page! Rifki is a skillful card game for four players from Turkey, played with a standard 52-card deck. 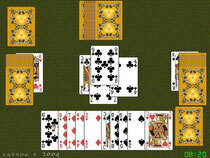 In the course of a session, each player will get the chance to declare five contracts, so that there are 20 hands played in all. Over the course of 20 hands, each player must declare a trump contract two times and a negative contract three times. Each of the six negative contracts can only be declared twice per game, so if a negative contract has been played twice, the declarer cannot choose that contract. In each of these contracts, each player is playing for herself. There are six "negative" (Card-based and Trick-based ones) and one type of "positive" contract. In negative contracts, there are no trumps. Players must follow suit if possible. A player who holds a penalty card in the suit must play it if a higher card in the suit has been played that trick. A player who cannot follow suit must discard a penalty card if they have any. In certain contracts there are restrictions on what card may be led to a trick.